Home » MEN'S GOLF CLUBS » Men Drivers and Fairway Woods » AGXGOLF 8.5 DEGREE TITANIUM DRIVER GRAPHITE SHAFT+HEAD COVER ALL SIZES, CHOOSE FLEX: BUILT IN USA! 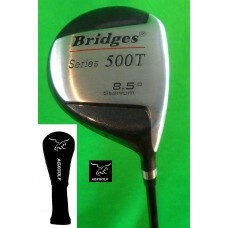 NEW FROM AGXGOLF; "500T SERIES" 8.5 DEGREE TITANIUM DRIVER with GRAPHITE SHAFT (CHOOSE FLEX AND LENGTH): FREE HEAD COVER!!! BAM.!!! BUILT IN THE U.S.A, BY THE SAME COMPANY THAT BRINGS YOU THE MAGNUM AND BALLISTA GOLF CLUBS ! WE'VE RECEIVED REQUESTS FROM MANY OF YOU WHO WANT TO TRY OUT AN 8.5 DEGREE DRIVER, OR WANT ONE IN THERE BAG WHEN THEY PLAY LONGER MORE OPEN COURSES. Yes these are BRAND NEW still in the factory wrap! ...Includes One year Manufacturers WARRANTY!! The Manufacturer's Suggested Retail Price for this item is $99.95..... YOUR PRICE IS MUCH BETTER!! NOW YOU CAN GIVE IT A TRY FOR THE PRICE OF A COUPLE DOZEN GOOD GOLF BALLS!! "GO LONG GO LOW"
These are of excellent quality and made from the same top quality materials as our Magnum and Ballista golf clubs. OVER SIZED FORGED TITANIUM HEAD for Larger "SWEET SPOT and extra DURABILITY!! As always we have had excellent feedback with AMERICAN GOLF EXCHANGE Golf Clubs. SO DO IT!! GO LONG!! AMERICAN GOLF EXCHANGE is headquartered right here in Michigan. WE HOPE YOU ENJOY PLAYING THIS FINE DRIVER AS MUCH AS WE ENJOYED CRAFTING IT!